This easy to use, ultra sheer/dry touch continuous spray formula will help protect your skin from harmful UVA/UVB rays while enriching your skin with Vitamin E, an antioxidant that helps to neutralize free radicals, which are the main cause of premature skin aging. Features / Benefits: UVA/UVB Broad Spectrum Protection, 4 Hours Water Resistant, Hypoallergenic, Won't Clog Pores, Paraben Free, Oil / PABA Free, Gluten Free, Cruelty Free, Retinyl Palimate Free, Propylene Glycol Free, Dermatologist Tested. Even when protected, avoid prolonged exposure to the sun. Wear protective clothing, hats, eyewear and sufficient sunscreen when exposed to the sun and for all unprotected areas. Store below 25 degrees celsius. Hold container 10 to 15cm from the skin to apply. Spray liberally/generously and spread evenly by hand 20 minutes before sun exposure. Spray on hands then apply to face. Reapply: After 80 minutes of swimming or sweating. Immediately after towel drying; and at least every 2 hours. Store below 25C. Active Ingredients: Homosalate 150mg/mL, Oxybenzone 60ml/mL, Octyl Salicylate 50mg/mL, Butyl Methoxydibenzoylmethane 30 mg/mL, Octocrylene 27.5 mg/mL. Contains: Ethanol. Caution: For external use only. Keep out of eyes. (Rinse thoroughly with water if contact occurs). Do not use on broken, damaged or diseased skin. If a rash or irritation develops and lasts, discontinue use and contact a doctor. For sensitive skins, test product for any skin irritation on a small area of the skin prior to use. If accidental ingestion occurs please contact the Poison Information Centre (AUS 131 126, NZ 0800 764 766). Consult a doctor before use on children under 6 months of age. Extremely flammable. Do not spray on a naked flame or any incandescent material. Protect from children and sources of ignition. Pressurised dispenser. Do not expose to sunlight and temperatures exceeding 50 degree celsius. Do not puncture or incinerate, even after it's final use. 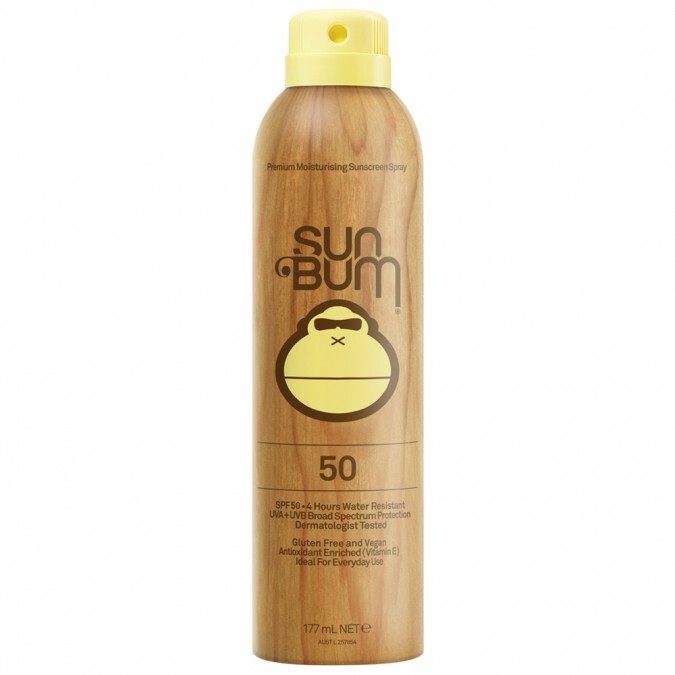 This sunscreen badly stains clothes. My white and cream clothes were stained a light brown colour. I have not experienced this with any other sunscreen in the past.